Alpha-amylase is also believed to play a key role in the establishment and maintenance of the oral microflora to form dental plaques. Although its release from the salivary cells is greatly increased in response to taste or chewing motions of the jaw, salivary α-amylase levels are not related to α-amylase levels in blood, which are derived from pancreatic secretion. In addition, alpha-amylase is present in low levels in non-stimulated saliva between meals, due to its important anti-bacterial role in the oral cavity. 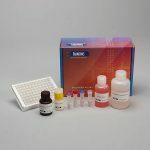 Using a small sample volume, this direct saliva assay kit has an extended range which spans the expected alpha-amylase levels found in human saliva. The average inter- and intra-assay precision coefficients of variation are low with no deleterious matrix effects often found in saliva which are characterized through dilution- and spike-recovery validation procedures. 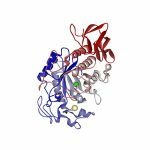 This alpha-amylase assay kit has also been formatted to minimize cross reactivity for related proteins. The Salimetrics Alpha-Amylase Kinetic/Enzymatic Assay Kit is specifically designed and validated for the kinetic measurement of salivary α-amylase activity. It is not intended for diagnostic use. It is intended only for research use in humans and some animals. Salimetrics has not validated this kit for serum or plasma samples. Technical advances that make the assessment of biomarkers in saliva possible have enabled researchers to non-invasively study biosocial processes related to stress in naturalistic contexts. Secretion of alpha-amylase from the salivary glands is controlled by autonomic nervous signals, and substantial literature reveals that salivary alpha-amylase is a correlate of sympathetic activity under conditions of stress. Studies show that levels of salivary alpha-amylase increase under a variety of physically (i.e., exercise, heat and cold) and psychologically (i.e., written examinations) stressful conditions in human subjects. Interestingly, studies show that cortisol levels often do not correlate with α-amylase during stress, suggesting that individual differences in alpha-amylase represent a response to a stress signal independent of the LHPA axis. Early studies on salivary alpha-amylase showed that its concentrations are predictive of plasma catecholamine levels, particularly norepinephrine (NE), and are highly correlated with NE changes in response to stress. However, more recent studies call this relationship into question. The literature does show that stress-related increases in salivary alpha-amylase can be inhibited by the adrenergic blocker propranolol and also that beta-adrenergic agonists are capable of stimulating alpha-amylase release without increasing salivary flow. This link suggests that the same stimuli that increase autonomic (sympathetic) arousal may activate sympathetic input to the salivary glands. The salivary alpha-amylase response to stress is complex, however, and it appears also to involve the parasympathetic system to a lesser degree. A recent article has emphasized the contribution of the parasympathetic system to salivary alpha-amylase secretion, pointing out in particular that autonomic reflex activity from the oral cavity, which can increase the parasympathetic signaling to the salivary glands, may have the potential to obscure the effects of central SNS activity. However, a subsequent study has found that salivary alpha-amylase responses significantly predict responses to the TSST for norepinephrine (NE) but not for epinephrine (E). The relationship between salivary alpha-amylase and NE was stronger than the relationship between NE and E responses, indicating the predictive power of salivary alpha-amylase is well within the expected range for different SNS markers. Although further work is necessary to understand better the underlying physiological factors that influence salivary alpha-amylase secretion, studies have already shown that salivary α-amylase measurements may be employed as a non-invasive measure of autonomic nervous system activation and are related to a variety of behavioral, social, health, and cognitive phenomena in human subjects. This method for alpha amylase activity determination utilizes a chromagenic substrate, 2-chloro-p-nitrophenol linked with maltotriose. (17) The enzymatic action of α-amylase on this substrate yields 2-chloro-p-nitrophenol, which can be spectrophotometrically measured at 405 nm. The amount of α-amylase activity present in the sample is directly proportional to the increase in absorbance at 405 nm. For ease of use, the reaction is read in a 96-well microtiter plate with controls provided.